Folsom Skis is based in Denver Colorado and into its tenth year of existence. All sales, operation, management, manufacturing, quality assurance etc are all in-house from one facility. In a day and age when so much is built outside of North America, that Folsom is handmade in North America should and does mean something. Folsom’s distinction is in ski customization. Bespoke off-the-shelf models are available (either direct from Folsom or from select retailers). However Folsom’s expertise is in tailoring a ski to the skier’s needs and wants. Topsheets can be supplied by Folsom or by a customer (I saw a topsheet with a photograph of a skier’s deceased brother killed in an avalanche; a touching tribute). 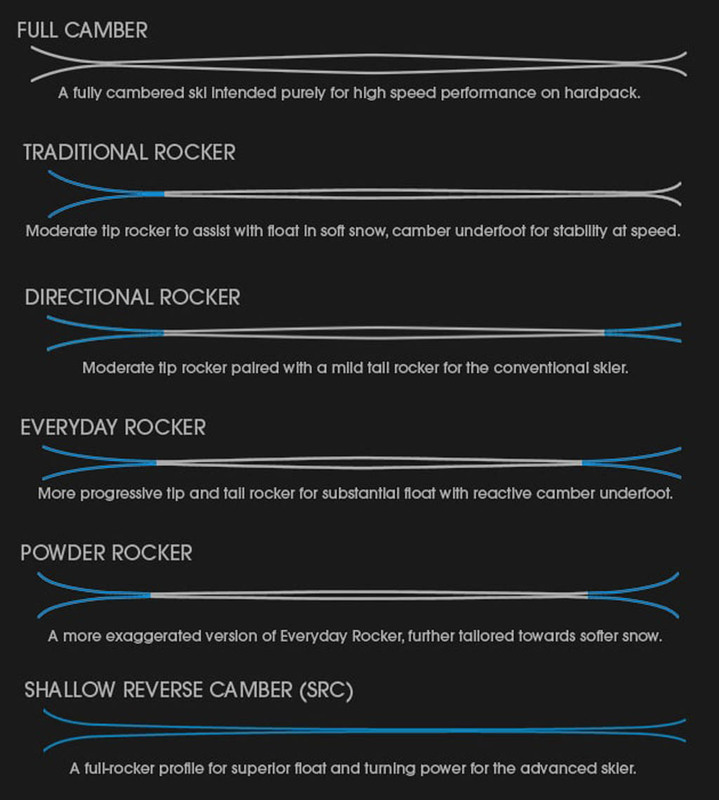 Shape, flex, camber, rocker can also be custom-tuned either in consultation with Folsom’s resident exceptionally expert skiers or by the discerning skier herself with the aid of a customization intake form, and then a phone and email consultation process. Folsom sent me some Cash 106 skis. 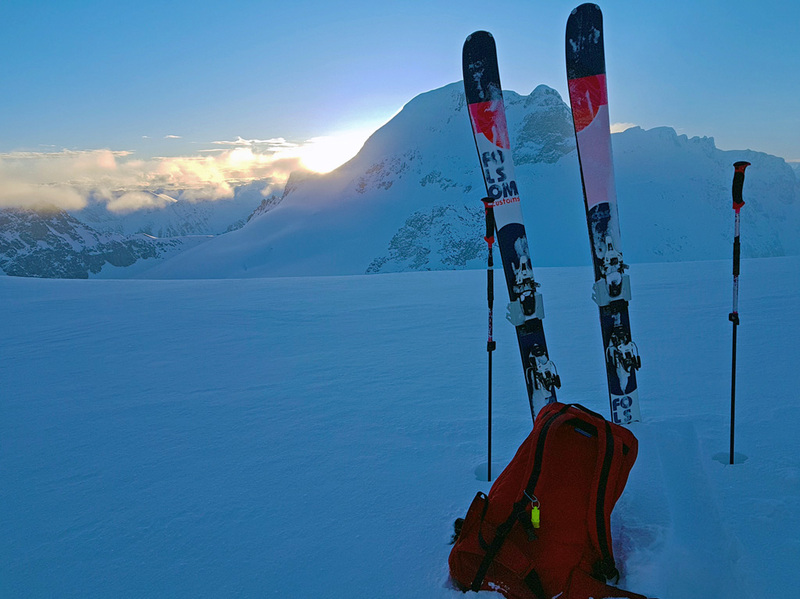 I paired these skis with Fritschi Vipecs (in my opinion the best pure touring binding currently produced) and combinations of light and heavier boots (Salomon Mtn Labs, Dalbello Lupo AX120 and Atomic Hawx XTD130). I had 16 days on the Cash 106 skiing the setup on pure inbounds pow days, on some slackcountry days (couple of inbounds runs then off to tour) and some pure touring days. As context for this review I weigh 75kgs (165 pounds) and ski mainly in the Coast and Selkirk Mountains of British Columbia. My skiing is usually in high moisture-content snow. Accordingly, my preference is for bigger skis. I requested the Cash as I was curious about using the ski mainly for soft snow and for touring. The Cash is a tapered elliptical tip shape with traditional side cut running through the tail. It can be thought of as a mild 5 point shape which Folsom calls a “smear and steer friendly tip shape combined with powerful and traditional tail shape”. Off the shelf a Cash 106 is USD $ 849. A custom version (as sent to me) would be $ 1299. The version I tested was a prototype in 187cms length which is the longest Cash in the 189 cms length but with a mild twin tip “touring specific tail. The less extreme tail splay/rocker combined with a rounded tail thus lops 2cms off from the either full twin tip or flat-tailed Cash 189 length. Here are some stats on the Cash 106 187 I tried. Core material can be either poplar and bamboo or poplar/maple/bamboo. I elected the latter core. Maple adds stiffness and being incredibly strong makes for longevity and a strong binding mount platform. Maple should also add torsional rigidity and dampness/shock absorption but also adds weight. Flex index picked was “moderate stiff”. This is a custom flex which puts the version of Folsom Cash I had towards the stiffer end of the spectrum.. Options one can elect are Soft/Playful; Moderate/Standard; or Stiff/Aggressive. Obviously materials picked (carbon, maple core) contribute to the flex index. Some Folsoms get the Full Carbon build (additional cost) which replaces all fiberglass layers wrapped around the ski’s core with sheets of carbon fiber. The carbon is lighter than the glass on its own and also absorbs less epoxy. With a ski like you have that would save about 300 grams per ski but the ski would then be a bit less damp. You can also get a Light Fiberglass option which substitutes 30% of the glass for carbon sheets hopefully achieving a happy medium. My Cash 106 was the Full Carbon version. Folsom builds the Cash 106 as a “user friendly all mountain ski”. The moderate/stiff Cash I skied was a bit mischaracterized. It has one speed and that’s mach schnell. The good; the Cash is incredibly stable and confident when you get it up to a certain speed and you ski it with intent. The bad; get into tight spaces, back off on aggression, get a bit back-seat or a tad lazy and you won’t be driving the Cash, it’ll drive you. I am told (and found it to be true when trying another Folsom in the medium flex) that the stiff flex Folsoms are truly stiff. A medium flex Folsom for a skier of my relatively light weight would have been more in keeping with the user-friendly tag ascribed by Folsom to the Cash. Be advised that Folsom doesn’t sandbag its flex-ratings. Stiff means stiff! In powder the Cash performed beyond its size. Porpoising medium radius turns or long-radius arc turns were well within the ski’s sweet spot and I never found a speed limit. The Cash’s tip splay and tip shape kept it floating well; beyond what one would expect for a ski of that size. The Cash was also easy to move around and more playful then one would expect from a ski with a -8 from centre mount. As long as you got it up to a certain healthy speed, altering turn shape, getting cheap air, loading up the stiff tails to jet out of a turn – all of that was easy to accomplish with the flick of a hip and fore-aft movements. Because the Cash has fairly consistent stiffness along its entire length it was easy to weight the ski and load it simply by moving weight from heel to toe and back. While a softer ski might collapse at tip or tail and round out or spin the Cash stored energy and gave it back – as long as you were ready for it. This means that the Cash was really “poppy”. The energeticness of the ski also extended the Cash’s range in deep powder making it float more than what one would expect for a 106 waisted ski. What the Cash also has in spades is predictability. 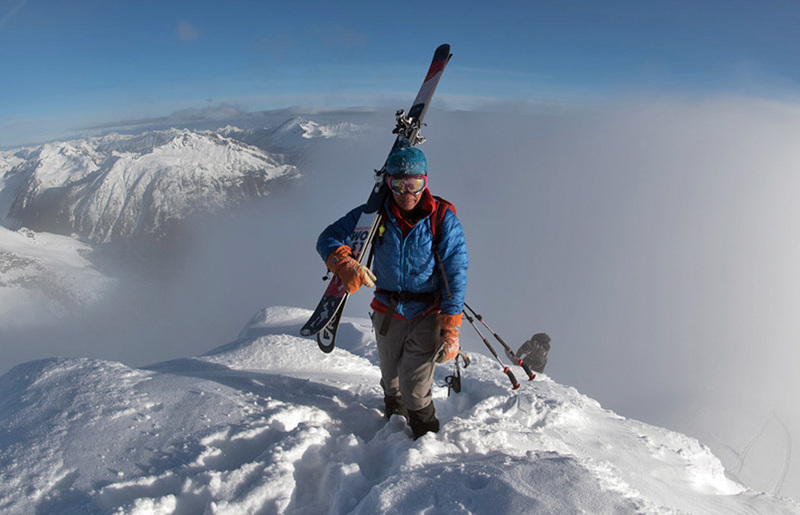 One doesn’t search for variable snow; it often finds you especially when ski-touring. 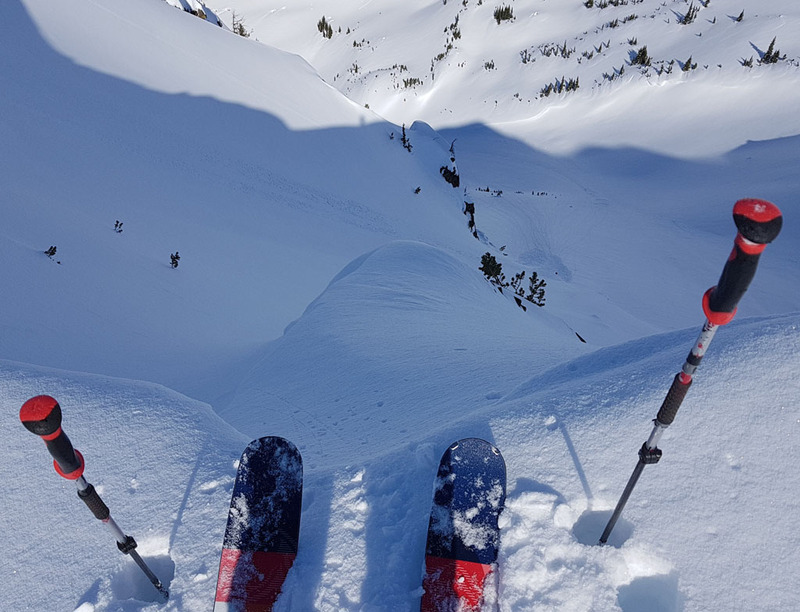 My vivid recollection is skiing off chutes in the Blackcomb backcountry and completely ignoring radio’ed conditions that the powder of the entry bowl overlaid stout breakable crust and avalanche debris at the bottom of the runout (this is a guy thing). Mid-way through the run I was having a blast and picking up speed then had my uh-oh moment entering the variable snow. But I pressured the Cash and let the skis run and they did their thing and survived without faceplant inducing tip dives and tomahawks. The fact that I stayed on my feet I would attribute not to any natural ability but to the Folsom Cash 106’s extraordinary stability, dampness and its overall stiffness. Usually a bit of heft aids in cutting through variable snow. This makes sense intuitively due to mass having inertia. However, at approx. 1800g per ski the Cash isn’t a heavyweight; personally I consider 1600g to be featherweight in a ski of this size so I’d call the Cash average weight for this size of ski. What stands out in my mind is that if you set an edge and get some speed the Cash will hold the line and not easily be deflected; feeling like a ski that will punch above its weight. The Cash performed acceptably well in hardpack. Folsom’s directional rocker calls for plenty of underfoot camber. This camber as well as the exceptional stiffness of the ski underfoot coupled with the stiffness of tip and tail is appreciated for edgehold and ability to carve. Here the predictability of the Cash’s overall running length stiffness played well to its stability on hardpack. Let the ski run, lean on the Cash’s edge and it repaid skier input with as much speed as one seemingly wanted to let it have. 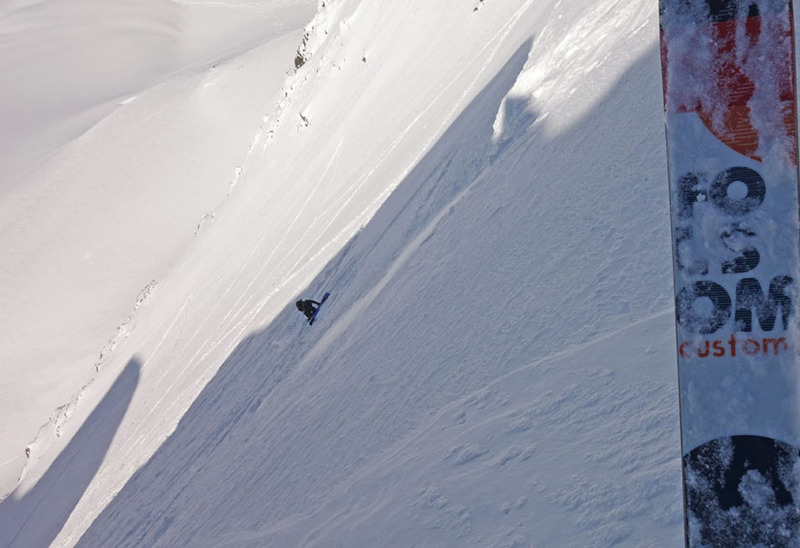 However a caveat is that the Cash requires a certain speed, energy and commitment to turn not only in powder but on hardpack. 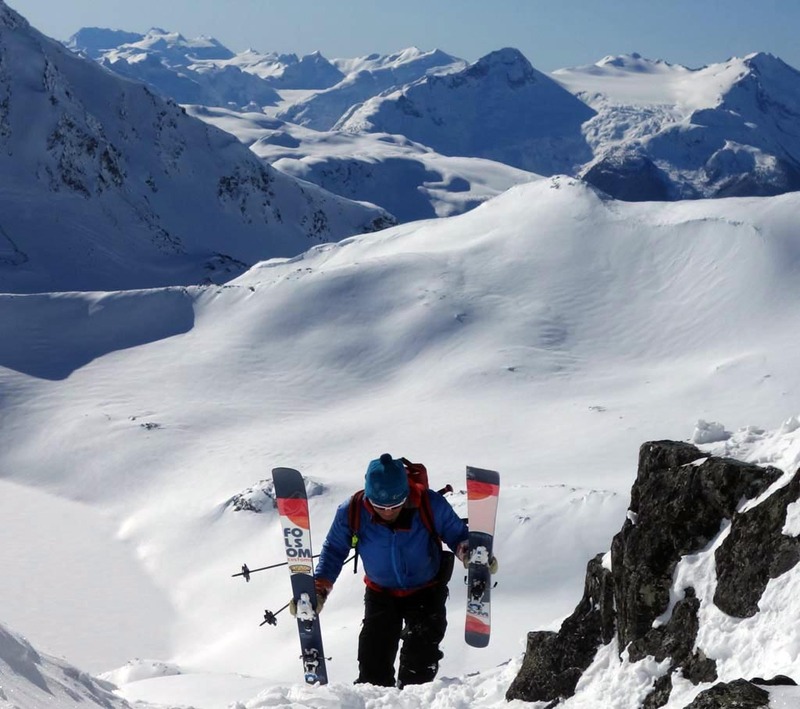 By definition, ski-touring requires exiting iced up inbounds runs, variable snow in tight terrain or crapped out access roads. This is where the moderately stiff Cash was a handful – for me. Short swing turns, quick snappy panic changes of directions is not the moderately stiff Cash’s forte. 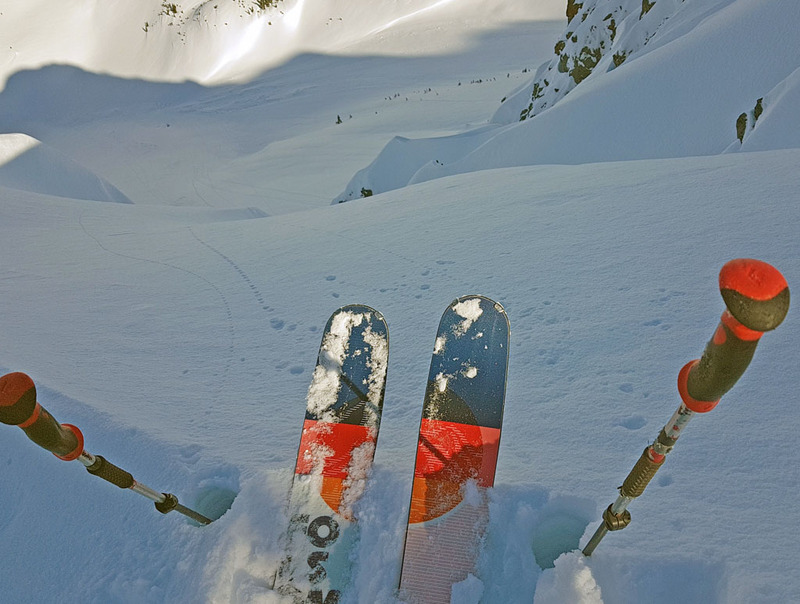 For that reason I would recommend the Cash in a softer flex in spring skiing, ski mountaineering or any scenario where you want to conserve energy or think you’ll end up in tight spots. For touring the Folsom Cash 106 has a fair bit of tip rocker and some tail rocker.. This is a big benefit for deep pow trailbreaking. The -8 from centre mount was also touring friendly as there wasn’t that much tail to get in the way when herring-boning or on kick-turns. As also previously mentioned, the Cash’s 1800g per ski weight puts it in the medium weight category for skis of this size. Custom skis are expensive! 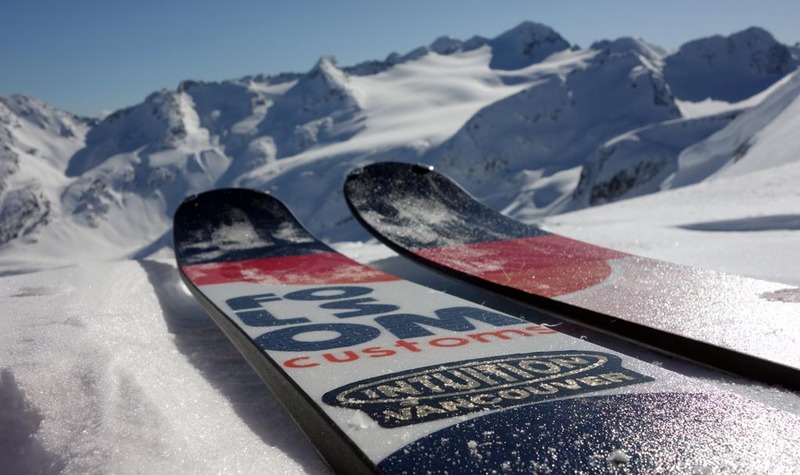 Not only are they expensive but you get the human factor in designing a ski to fit your needs! I freely admit that a skier of my weight would have had a more all-around user-friendly experience on a Folsom Cash of moderate stiffness. Instead I got a run-over-small-kids monster truck, balls-to-the-wall pow-destroying machine. That custom ski experience also results in a ski that will last for more than a season or two. Third-party reviews attest that Folsoms do not tire or lose flex easily. To summarize, the Folsom Cash hits a lot of sweet spots. If you want to hit mach speeds in pow or variable conditions then go with the stiffer build. If you want to ski tight trees, arc tight or medium radius turns or hop-turn steeps go with the medium or softer builds. If you want a handmade in North America hard-charging ski which lasts practically forever it should be a consideration. This entry was posted in 2018, ski2018 and tagged Folsom, review. Bookmark the permalink.